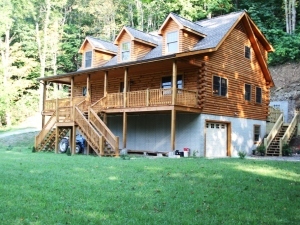 New Construction - Log Home. Located in the gated community of Shaw Mi Del Eca Village in Caldwell. Enjoy the front covered porch or the private back deck with patio area. Offers 3 bedrooms and 2 baths with large open floor plan and Loft area. Full unfinished basement offers Garage with 2 entrances and lots of storage. This home has lots of extra features. Directions Travel on Rt. 60 turn into Shaw Mi Del Eca Village. Security code provided at office. Log home is located 1st on the Right. Information is deemed to be reliable, but is not guaranteed. © 2010 MLS and FBS.